In 2014, UNAIDS and its partners set the ambitious “90-90-90” targets to help end the AIDS epidemic, callinIn 2014, UNAIDS and its partners set the ambitious “90-90-90” targets to help end the AIDS epidemic, calling for diagnosing 90 percent of all people living with HIV, providing antiretroviral therapy for 90 percent of those diagnosed, and achieving viral suppression for 90 percent of those treated by 2020. This brief describes how Malawi’s Ministry of Health, in collaboration with partners, linked nutrition services with HIV care and treatment and presents the resulting data, lessons, and recommendations that can inform other efforts to meet the 90-90-90 targets.g for diagnosing 90 percent of all people living with HIV, providing antiretroviral therapy for 90 percent of those diagnosed, and achieving viral suppression for 90 percent of those treated by 2020. 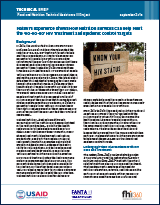 This brief describes how Malawi’s Ministry of Health, in collaboration with partners, linked nutrition services with HIV care and treatment and presents the resulting data, lessons, and recommendations that can inform other efforts to meet the 90-90-90 targets.